The average boiler system, when it is properly maintained, can last around 15 years. If yours is nearing this age or has already reached it, you’ll want to consider how efficiently it’s still operating and if it has excessive repair needs that would make it more financially sound to replace the system. Keep reading for more signs of a boiler in distress, and keep in mind if you are affected by any of the following problems and your boiler is on the older side, replacement is probably your best option. One of the signs of a boiler in distress is unfamiliar or unpleasant smells coming from the system—these should never be ignored! They could be a sign of a gas leak, which needs to be addressed immediately when you notice it. Even if the smell isn’t caused by a gas leak, it may be a problem with your ventilation system that needs to be fixed. A leak is definitely something you should never ignore when it comes to your boiler system. Not only can this lead to significant property damage in your home, it can be a sign of something going wrong inside your boiler, plus it can lead to system inefficiency. If your water is usually cooler or hotter than what the temperature should be, you may have a problem with your boiler. The water is probably not circulating like it should be, which means your boiler cannot consistently heat your home. It makes sense that your energy bills will be higher in the winter when you’re using your boiler. However, if they’re significantly higher than what they were last year, or higher than what your neighbors are paying for similar use, then you may have a system that isn’t performing as effectively and efficiently as it once did. Boilers are sturdy heating systems that shouldn’t require too many repair needs over its lifetime. 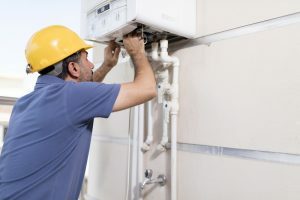 If, however, you find yourself calling for repairs every few months, then your aging boiler has probably degraded to the point that replacement simply makes the most economical sense. For expert boiler repair service and more in Camden County, NJ, contact Ambient Comfort today.